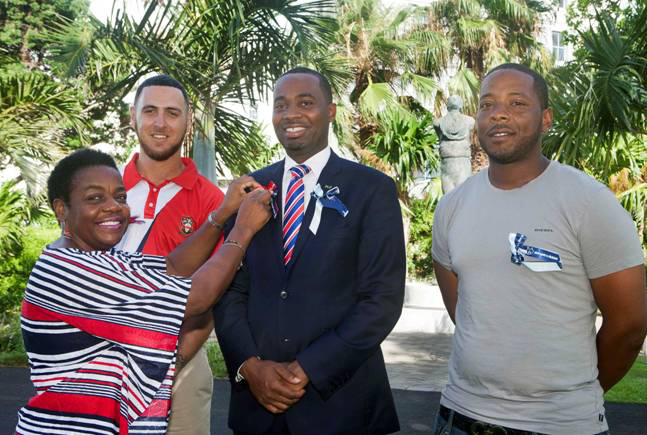 In advance of the much anticipated Cup Match holiday, Family Centre’s Executive Director Martha Dismont pinned their Cup Match Tag Day ribbons on Premier David Burt and Cup Match cricket team captains at the Cabinet Office this morning. Whether it was a coincidence or deliberate is unclear, however both Ms Dismont and the Premier were wearing Somerset colours. The Family Centre is continuing to look for volunteers for their tag day, and those wishing to volunteer can sign up via the Family Centre Facebook page. St. George’s oh where art thou is your team shirt?